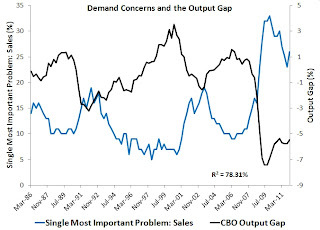 Probably the most important debate on U.S. monetary policy is whether there really is an aggregate demand shortfall and, as a result, a negative output gap. If the answer is yes, then the Fed should be doing more. If no, then monetary policy should show restraint. Some Fed officials like St. Louis Fed President James Bullard and Minneapolis Fed President Narayana Kocherlakota believe there is no significant aggregate demand or domestic output gap problem and thus want to tighten monetary policy soon. Fed chairman Ben Bernanke, on the other hand, believes there is still ample slack in resource markets and is open to further monetary stimulus. And then there are the Market Monetarists and other like-minded commentators in the blogosphere who think there is a significant aggregate demand problems since the Fed has been effectively tight since mid-2008. Who is right? 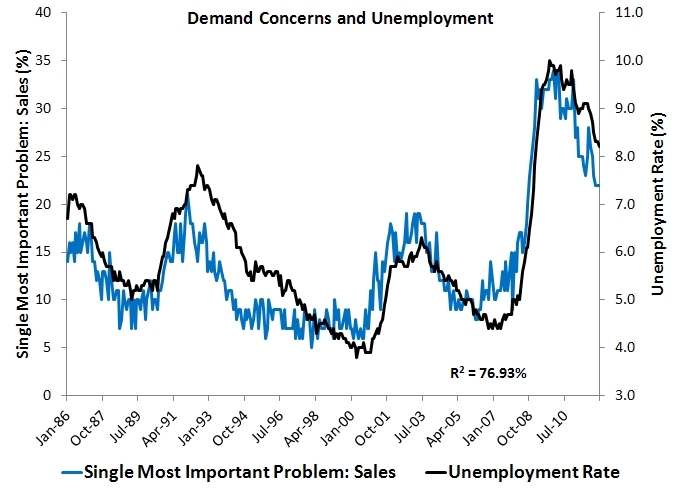 The first thing to note from this figure is that concerns about sales or demand became the most important problem. It alone explodes in 2008. Regulation, taxes, and labor quality (sorry Kocherlakota , no labor market mismatch problems here) did not sharply intensify. 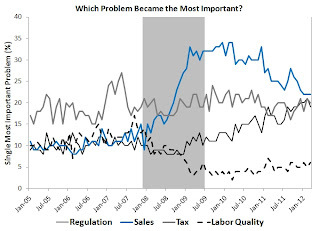 Labor quality concerns actually fall and though regulation eventually starts to gradually rise, concerns about demand were and continue to be the foremost among small firms. There is more to the poor sales data. It closely tracks the unemployment rate and the output gap as seen below. These findings undermine Kocherlakota and Bullard’s claims that the CBO’s output gap is overstated. 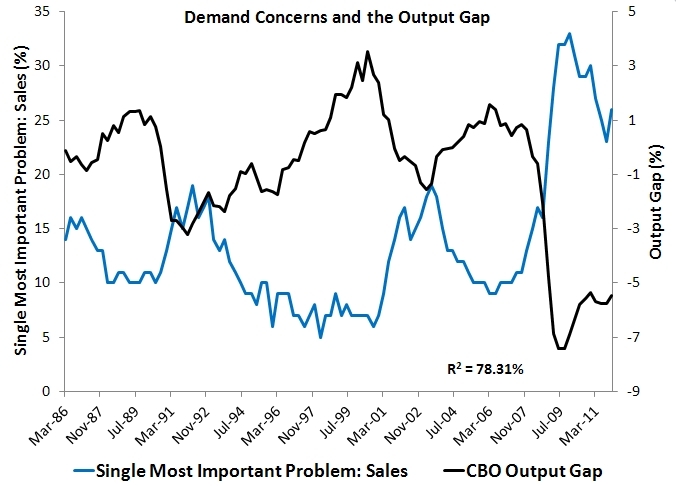 For if the output gap were truly smaller and there were no serious aggregate demand shortfall, then one would not expect to see the relationships below. 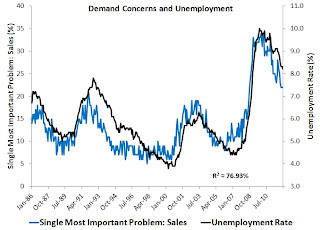 This evidence in conjunction with that of downward wage rigidity, excess money demand, and the Fed handling the housing recession just fine for two years should remove any doubt about whether there’s an aggregate demand problem. The real debate is how best to respond to this problem. P.S. See Mike Konczal’s earlier post using the NFIB data. One Response to "Is There Really an Aggregate Demand Problem?" why is this article directed at the Fed? Try THE PENTAGON then it would make sense. Of course there is a AD CATASTROPHE. The American consumer has been KILLED. HOWEVER! "He has been incentivized to take the debt deal" and get his credit rating back. The banks strangely enough have NOT been! Say what???!!! Anywho i see prices wars galore breaking out all over the place as a consequence. GOOD LUCK BIG GOVERNMENT!